Click the image below to see an introductory slidedeck about us! 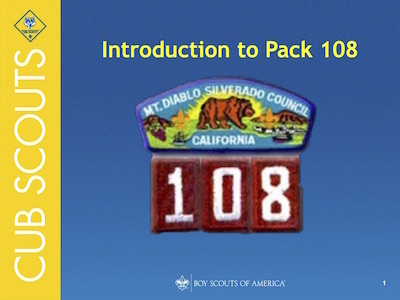 We are pleased that you are considering joining Cub Scout Pack 108. It is our hope that you and your young one will find your time with Pack 108 a rewarding and fun experience in which to continue or begin your Scouting adventure. We have an active Cub Scout program, with Pack meetings every month, Den meetings and other experiences throughout the year. We encourage attendance at as many activities as possible. Some activities can help the youth advance through the Cub Scout ranks or earn belt loops and badges. We want families to be active as well! We have numerous positions available, ranging from a once-a-year commitment to Den Leader to Pack administration. We have a Pack Committee made up of leaders and other adults, and that is always open to parents that usually meets on the second Monday of the month to discuss and plans events and the fundraising necessary to help Pack 108 go and to support the plans made by Den leaders. In order to join the Cub Scouts, a boy or girl must be entering Kindergarten to join a Lion Den. First grade youth then transition to a Tiger Den. Upon completion of the first grade, a youth moves into a Wolf Den and work towards their Wolf rank. The following year, s/he enters a Bear Den. Again, working towards his/her Bear rank. During the fourth and fifth grades, youth enter Webelos, perhaps the most challenging Cub Scout program for the boys. Webelos prepares youth for advancement to Boy Scouts. As hinted all throughout these pages, we suggest that a prospective scout visit our Pack Meetings before deciding to join. This will give a youth and their family a chance to see how the Pack operates and what it has to offer. Once you decide to join us, then you will need to fill out an Cub Scout Youth Application form online (http://www.scouting.org/onlineregistration.aspx) or pick one up form the Pack 108 Cubmaster. Once the application is filled out it is submitted to the Cubmaster, Treasurer or appropriate adult leader with the applicable dues. We encourage adult family members to submit Adult Application. When you turn in your application, there is a $24 annual fee. You will also need to go online and complete the Youth Protection Training (See Youth Protection Training Document). The BSA requires that a printout of the certificate you receive from the online training must be submitted with your Adult Application. Without the certificate, your application will not be accepted. The Cub Scout philosophy is to always provide adult leadership at least two deep. Even if you are not a Den leader, it is good to register as an adult leader. There is no doubt that your young one will get out of scouting as much as you are willing to put in. A few hours is a small investment in your youth’s future.